Hall of Heroes | Crockett Foundation - Tag In & Help Out! The 2015 Hall of Heroes Induction Ceremony was filled with both laughter and tears. Held on a warm Friday night in Charlotte, NC, it was brought to order by emcee, Jim Cornett, with the ceremonial 10 rings of the wrestling ring bell honoring the life of Roddy Piper. Word had spread quickly through the banquet hall that the dear friend of most in attendance had died. Many who were there to induct or be inducted spoke kind words with tears in their eyes as they shared a few special memories of Roddy with the crowd but as they say, the show must go on. The former athletes, including Ivan Koloff, Magnum T.A., Les Thatcher and the always cantankerous, Ole Anderson along with their families had come together on this night to honor a few of their own with an induction into the Hall of Heroes. The attendees were hysterical listening to Gerry Brisco regale them with the story of the first time he and his brother Jack Brisco met inductee Ricky Steamboat. As Gerry told it, the arena he and his brother had a match in that particular night had a shared dressing room. To kill time, he walked next door to the other side. When he walked in he saw what he described as a handsome Hawaiian God with shiny black hair and amazing physique. The then Richard Blood stood up and introduced himself to Gerry. Gerry shook Richard’s hand and politely excused himself. Gerry walked back to his dressing room and asked his brother Jack to accompany back to the other side to meet the Brisco Brother’s replacement. Gerry and Jack knew immediately that this kid had IT. As they stood around talking to the newcomer, they started to fine tune Richard Blood’s ring persona. The first thing the Brisco Brothers told Richard is that his last name could not be Blood. The fact of the matter was that Richard was entirely to handsome to be a heel and with a last name like Blood that would almost be the only part he could play. So they spit balled names amongst themselves until they finally came up with the now famous, Ricky Steamboat. The usually reserved, Ricky Steamboat, was shouting back at Gerry onstage during these stories with “You’re killing me!!”. Gerry’s job was to induct Ricky and his tag team partner, Jay Youngblood into the Hall of Heroes but not without a little story telling first. 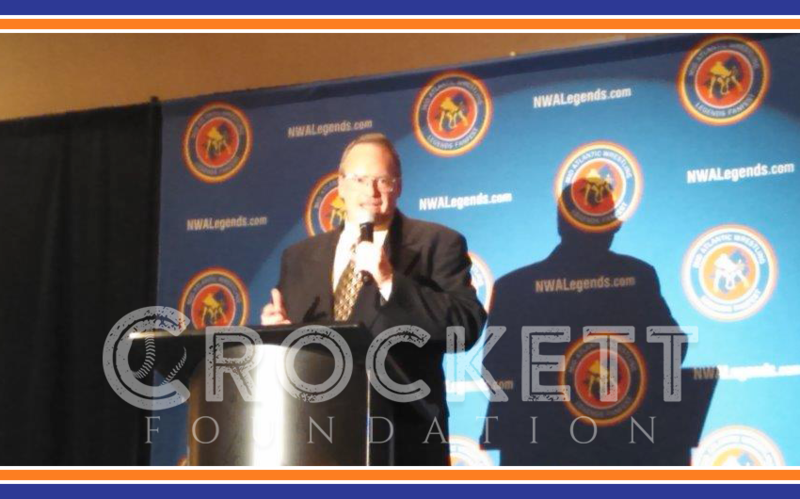 The main event of the evening was the induction of Jim Crockett, Sr. into the Hall of Heroes. Jim Ross, wearing his ever present black 10 gallon cowboy hat, started his induction by telling the crowd that he never had the privilege of meeting Big Jim but that did not keep him from knowing the pronounced effect Jim had on wrestling in the ’60s and 70’s but the effect he had on wrestling as we know it today. Jim Crockett, Sr. was known for not only having a keen eye for wrestling talent but he was an honest wrestling promoter. Two words not overused in the same sentence. Honesty is the cornerstone of all success and the first chapter in the Book of Wisdom. Mr. Crockett was both successful and wise. Big Jim realized that early on, and relied on that principle for the rest of his life until his untimely death in 1973 at the age of 64. He believed that there was no right way to do something wrong. Mr. Crockett was a brilliant promoter who knew his audience, what they wanted and how to find them. This giant of a man thought largely with his heart, so is he, as is said in Proverbs 23:7. The crowd rose to their feet as the Crockett Family, represented by Frances Crockett, David Crockett and Jackie Crockett, took the stage. The standing ovation lasted several minutes as the admiration and respect for Jim Crockett filled the room. David Crockett addressed the crowd by first thanking the Hall of Heroes Induction Committee for honoring their father. In David’s words, none of his father’s dreams could have come true without the wrestlers and fans. Jim Crockett ran his life and business through honesty and a hand shake as those in the room that knew Jim nodded in agreement. David reminisced about their father by sharing that his father was gone most of the day. Big Jim went to work at his restaurants before dawn and came home late at night after whatever promotional event he was putting on that night but that no one would have had it any other way. The lessons of hard work and perseverance learned at their father’s side were invaluable. Once again, the crowd rose to their feet to honor the memory of Jim as the Crockett Family left the stage. The evening ended as the crowd broke up into small groups while the inductees and inductors stood on stage for the 2015 class picture. There was stories being told and pictures being taken as the old friends relished their time together that night. All in all it was an incredible night to be with the living wrestling history that filled that hall.